Blog What Is Mirror Box Therapy? Mirror Box Therapy is another tool that that is used to harness the brain’s ability to rewire itself and assist with recovery following stroke. Recent evidence supports the effectiveness of Mirror Box Therapy as an inclusion in rehabilitation for improving motor function, reducing pain, reducing neglect and reducing sensory impairment following stroke. For example. 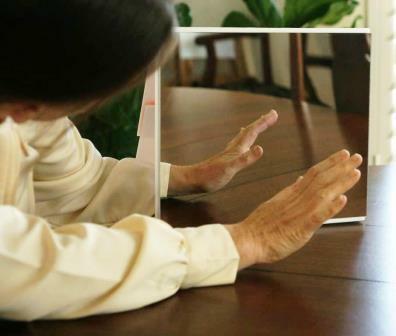 when a stroke survivor puts their weakened hand inside a mirror box, and moves their strong hand, the mirror box gives the illusion of movement occurring in the hand affected by the stroke. Stroke survivors can practice various movements of the hand, wrist and fingers of the unaffected hand while watching the reflection in the mirror. The moving reflection provides the brain with the illusion that the stroke affected hand is active. This in turn has the potential to switch on parts of the brain related to the hand and assist in the ‘rewiring’ that is part of neuroplastic recovery following stroke. Physiotherapy stroke rehabilitation to regain movement of the arm and hand should include strengthening exercises and task-specific practice with appropriate guidance from a neurological physiotherapist to achieve the ‘just right’ challenge. Mirror box therapy, along with other interventions such as mental practice and electrical muscle stimulation are considered as additional tools that may enhance recovery.